When you want an alternative to a traditional card game, try turning to dominoes. A game of dominoes is more than lining tiles up end to end or creating domino mazes. 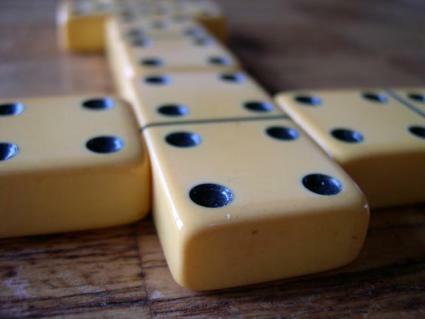 Just like a deck of cards, a set of dominoes can be used to play a variety of different games. You don't need a physical set of tiles to enjoy all of those versions of the game, however. Whether you want to play dominoes alone or with others, you can play online. Dominoes-Online offers instructions and tips for playing dominoes, and then gives you a chance to test what you have learned by playing a game. Games are played against the computer. The website also offers the opportunity to connect with DominoesOnline through Facebook and play against your friends. Devworks allows you to play a simple game of dominoes against a single computer player. On your turn, the game highlights the pieces you have available to play, making it easy to see what's in your hand and choose the right move. Zigiz gives you the chance to practice your dominoes game by allowing you to log in as a guest and play by yourself. Instead of playing against a computer, you practice using only the dominoes in your hand. When you register for the website, you can also play games and earn website credits by playing against the computer or others. Game Colony allows you to play dominoes with players from all over the world by joining or creating a table. You can also watch a table of other players to learn a little more about playing the game. Playing a game of dominoes is free, but you can use your Game Colony tickets to play games in ad-free rooms or join special domino tournaments. You must register with Game Colony to play. 42 Now allows you to play a special version of dominoes called 42. The game 42 is similar to bridge and typically played by 4 people. Players call a suit, such as threes or fives and try to win hands by playing those dominoes. In the online version, instead of playing against 3 other human players, you play against 3 bots. You can choose to play a full game or just a single hand. DillyDallyGames offers a version of Mexican Train Dominoes where you create a train of dominoes and must continue adding to that train. Each game lasts thirteen rounds and the person with the most points at the end of the game wins. There are a few tips to keep in mind to help you dominate the computer or other opponents and become a dominoes pro. Play your doubles early. These tiles give you fewer playing options later in the game because both ends contain the same number. Save lower numbers for the end. At the end of most games, the total number in your hand comes off your score, so it helps to help lower numbers in your hand. Keep your options open by trying to have different numbers in your hand. For example, don't play all your threes at once and keep only fives in your hand. Watch your opponent to figure out what he has in his hand. If he has to dig in the bone yard every time a four must be played on, you know he has a lack of fours. Focus on scoring rather than dominoing. If you can build your score up enough, you can win the game even if you are not the first player to run out of tiles. Know the rules. The Alex Cramer Company, which makes and sells dominoes, offers a nice overview of the rules for a basic game of dominoes and outlines common moves. The more you practice, the better you will become at playing the game. Start by playing against the computer to get a general feel for the game and its rules. Try to play games against a single opponent and games against multiple opponents and pay attention to how your strategy differs based on the number of opponents you have. As you learn to play, you will begin to develop your own strategies for scoring, playing tiles and becoming a great dominoes player.